More photos: of entire ship and of details. Click on the photos for high resolution pictures! The barquentine COTE D'ÉMERAUDE was built 1925 in Saint-Malo, France, and used for cod fishing off Newfoundland. The dimensions of the ship according to Lloyd's Register of 1932 were length (water-line) 42.6 m, width 9.75 m, 380 tons. Please take your time to have a good look at the set of photos. Click images to enlarge! This superb model of the COTE D'ÉMERAUDE was built to plans of the Musée de la Marine in Paris. It is a true masterpiece that took 2400 work hours to make. The sails are set as on port tack in quartering wind. The foremast has the flag for requesting a pilot, the mainmast shows the name flag of the ship and the name of the model maker, Spors. The mizzenmast has the flags for the year the model was built, 2005. The ship model is 1 : 60 scale. Length is 116 cm, width 34 cm, height 75 cm. This model is no longer for sale. 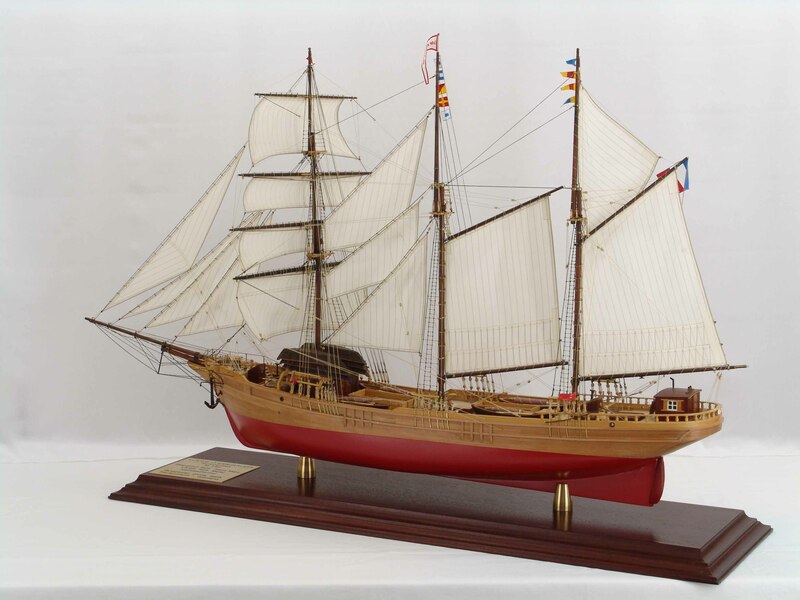 The pictures and the data are shown in the gallery of the ship models sold only to let enthusiasts and model makers enjoy the photos and maybe get ideas or some guidance, if someone builds such a model by himself.